Finnleo Saunas now manufactures several styles in the Seattle, Washington area, but the roots of the company are distinctly Finnish. 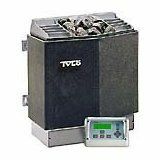 The parent company is TyloHelo (formerly Saunatec), a Finnish company that sells more sauna heaters than any other company in the world. While the units themselves are made in the U.S.A., the heaters are by Saunatec. Fortunately, Saunatec heaters are some of the finest on the market. One particularly nice feature is the unique heater design, which prevents the rocks from coming into contact with any metals, eliminating the "metallic" feel of some heaters. Finnleo also manufactures far infrared saunas, although this is a small portion of their sales. The same interior and exterior options (such as windows and decorator doors) offered on traditional saunas can be ordered for infrared versions. Finnleo saunas offer a variety of options, from inexpensive to high-end, but their focus tends to be on the latter. In fact, they offer twelve of the most popular sauna styles in over 100 models. If you can't find a sauna to suit your needs from Finnleo, you'll probably have to design your own. 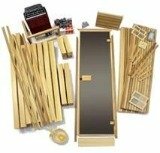 Since most of their models can be customized with decorator doors, a variety of floor plans, and optional windows, you can order a sauna that looks like it was custom built at a reasonable price. White spruce is used for the sauna interiors, in keeping with Finnish tradition. This is a very light colored softwood with an extremely tight grain that remains relatively cool to the touch. It is also less aromatic than cedar, giving the air in the sauna a cleaner, crisper feel. The outside of most of their saunas can be constructed with your choice of white spruce, red cedar, or a distinctive vertical grain hemlock. 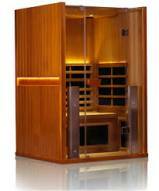 One of the most popular models offered by Finnleo Saunas is their Passport series. These combine easy installation with luxurious details. The walls are pre-wired, prefabricated, and ready to lock together so that you can quickly assemble and use your sauna on the same day. You can upgrade your Passport sauna with interior architectural details, including decorative woodworking, valance lighting options, Abachi wood interiors and multi-media components such as televisions and stereo sound. One of the most popular saunas in their designer series is the Solace, due in large part to the striking full glass front which gives it a modern, spacious feel. Other Finnleo designer saunas feature details like curved walls, frosted or etched glass doors, and hand-rubbed wood finishes that highlight the wood grains. As you can see, there are a lot of models to choose from. Finnleo Saunas has been an innovator in the marketplace for years, and they continue to invest part of their profits into research and development. The company also has certified repair specialists throughout the United States and Canada who can come to your home to do repairs or maintenance on your sauna. It's a definite plus to know that you won't be searching in vain for a qualified repairman if you ever have a problem with your sauna or heater. 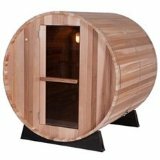 Should You Buy a Finnleo Sauna? Overall Finnleo saunas received very positive reviews from customers, and our reviews have revealed a very high quality product. The only issue is you can't buy one directly. Rather, you have to go through an authorized dealer, and there may not be one near you depending on where you live. Still there are a number of locations throughout the US and Canada, so you're apt to find something close enough for delivery. If not you can always call the company up and see what your options are. So if you like what you see, by all means choose a Finnleo sauna. They make great products and the company is rock solid.